246 pages | 33 Color Illus. | 1062 B/W Illus. Introduction to Imaging from Scattered Fields presents an overview of the challenging problem of determining information about an object from measurements of the field scattered from that object. It covers widely used approaches to recover information about the objects and examines the assumptions made a priori about the object and the consequences of recovering object information from limited numbers of noisy measurements of the scattered fields. The book explores the strengths and weaknesses of using inverse methods for weak scattering. These methods, including Fourier-based signal and image processing techniques, allow more straightforward inverse algorithms to be exploited based on a simple mapping of scattered field data. The authors also discuss their recent approach based on a nonlinear filtering step in the inverse algorithm. They illustrate how to use this algorithm through numerous two-dimensional electromagnetic scattering examples. MATLAB® code is provided to help readers quickly apply the approach to a wide variety of inverse scattering problems. In later chapters of the book, the authors focus on important and often forgotten overarching constraints associated with exploiting inverse scattering algorithms. They explain how the number of degrees of freedom associated with any given scattering experiment can be found and how this allows one to specify a minimum number of data that should be measured. They also describe how the prior discrete Fourier transform (PDFT) algorithm helps in estimating the properties of an object from scattered field measurements. The PDFT restores stability and improves estimates of the object even with severely limited data (provided it is sufficient to meet a criterion based on the number of degrees of freedom). Suitable for graduate students and researchers working on medical, geophysical, defense, and industrial inspection inverse problems, this self-contained book provides the necessary details for readers to design improved experiments and process measured data more effectively. It shows how to obtain the best estimate of a strongly scattering object from limited scattered field data. 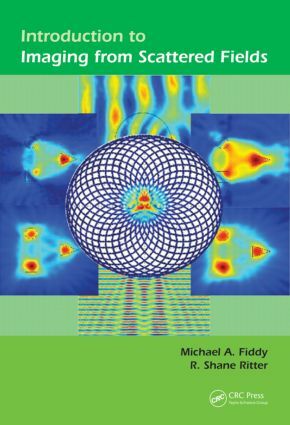 "It has gone straight to the top of my recommended reading list for students interested in the fundamental theory of waves and inverse scattering." "Introduction to Imaging from Scattered Fields is an essential guide to diffraction tomography and inverse methods. The text combines theoretical analysis of scattering models with practical numerical analysis in a highly accessible narrative." "This excellent text provides a clear and systematic treatment of the fundamental theory of waves and inverse scattering whilst remaining accessible to practitioners in remote sensing and imaging. It includes a range of examples and MATLAB code, and it should prove a valuable reference and textbook …"
"… bring[s] the practitioner or student of imaging up to the necessary level for understanding the physical and mathematical underpinnings of scattered fields and inverse scattering problems, with an ultimate eye on practical implementation to real problems in a variety of real-world imaging applications." Michael A. Fiddy received his PhD from the University of London in 1977, and was a research fellow in the Department of Electronic and Electrical Engineering at University College London before becoming a faculty member at London University (Kings College) in 1979. He moved to the University of Massachusetts Lowell in 1987 where he was ECE Department Head from 1994 until 2001. In January 2002 he was appointed the founding director of the newly created Center for Optoelectronics and Optical Communications at UNC Charlotte. He has been a visiting professor at the Institute of Optics Rochester NY, Mathematics Department Catholic University, Washington DC, Nanophotonics Laboratory Nanyang Technical University Singapore and ECE Department University of Christchurch NZ. He has also been the editor-in-chief of the journal Waves in Random and Complex Media since 1996, and holds editorial positions with several other academic journals. He was the topical editor for signal and image processing for the journal of the Optical Society of America from 1994 until 2001. He has chaired 20 conferences in his field, and is a fellow of the OSA, IOP and SPIE. His current research interests are inverse problems related to super resolution and metamaterial design. R. Shane Ritter is currently the Chair of the Engineering Department in the School of Professional Studies at Olivet Nazarene University in Bourbonnais, IL where he also serves as a Professor of Electrical and Computer Engineering. He has also served as the Director of Electrical Engineering for a number of engineering firms as well as an independent consulting electrical engineer in many different aspect of electrical engineering. He is currently licensed as a professional engineering in over 35 states, and he is also Registered Communication Distribution Designer (RCDD). Shane served as an adjunct faculty member in mathematics, statistics, and research for the University of Phoenix from 2001-2009. Shane also served as an adjunct faculty member in electrical and electronics engineering for the ITT Technical Institute in Charlotte, NC in 2010. Shane holds a BS and MS in Electrical Engineering from Mississippi State University, and a PhD in Electrical Engineering from the University of North Carolina at Charlotte.